Get yourself some Shoofly Pie! Pennsylvania Dutch cooking does not capture the same share of our collective food minds as do barbecue, Southern cooking, Cajun/Creole, or any number of other uniquely American cooking styles. It is overlooked and often misunderstood. Ask most people what they know of Pennsylvania Dutch cooking, and they are likely to mention the tourist smorgasboards of Lancaster County or (gasp!) scrapple! While you might be horrified at the thought of scrapple (I do love good scrapple), I think you will find many Pennsylvania Dutch dishes to enjoy and regularly add to your table. Noted food historian William Woys Weaver, author of the excellent examination of Pennsylvania Dutch cooking culture, Sauerkraut Yankees: Pennsylvania Dutch Foods and Foodways, writes, “Even where (the Pennsylvania Dutch) language is no longer spoken, or where there are no longer Pennsylvania Dutch names in telephone directories, people still cook Pennsylvania Dutch food and celebrate Pennsylvania Dutch festivals.” Sauerkraut Yankees, interlaced with content translated from Die Geschickte Hausfrau (The Handy Housewife), one of America’s first ethnic cookbooks, probes the strong heritage of Pennsylvania Dutch cooking and food culture. The Pennsylvania Dutch people are a diverse mix of “Plain and Fancy.” The “plain people,” of whom the Amish are the most common example, are the descendants of 18th and 19thcentury Anabaptist German immigrants. Descendants of Reformed and Lutheran German immigrants, who assimilated popular American culture, are the “fancy” part of the Pennsylvania Dutch dichotomy. Whether plain or fancy, the local food culture is common to both. Growing up in Pennsylvania Dutch country, I was surrounded by food and cooking every day. Farmers, small and large, look to make a living from their land, and that means producing something to eat. A drive in the countryside takes one past dozens of farm stands with signs telling passersby what they have to offer: potatoes, eggs, goat milk, cheese, corn, baked goods, etc. Many June evenings at the end of supper, as we enjoyed large plates of strawberries, short cake, and ice cream, the discussion between my parents turned to where tomorrow’s strawberries would be found. They exchanged comments on roadside stands they saw that day, and the quality and price of the berries. Through the year, we enjoyed each fruit and vegetable in its peak season, often freezing or canning excess for the off-season. Asparagus, cherries, sweet corn, peaches, lima beans….growing them ourselves or taking car trips to get the best available was a regular part of our routine. If we weren’t growing our own corn, we would contact the farm of choice to let them know what time we were coming and how much we wanted. That way, the farmer would be just rolling in on the picking wagon when we pulled up; this was our assurance of getting the corn at its peak sweetness. We would rush home to process it and get it in the freezer as fast as possible; everyone in the family had a task to get the job done. Meals varied with the seasons, too. Each New Year is rung in with roast pork and sauerkraut for good luck. Springtime brought dandelion or endive salads with hot bacon dressing. Easter is celebrated with ham. Summer brought loads of fruit and vegetables; whatever crops were producing surplus for fresh eating and preserving. While each meal featured meat in some form, the star in Spring and Summer was usually the fresh produce. My maternal grandmother pickled various items all summer long, and then combined them into Pennsylvania Dutch chow chow – I still remember picking out my favorite morsels: the big, meaty pickled lima beans and the cauliflower tips. Fall brought an end to the sweet corn season, but was a time of plenty as the last harvests were made and potatoes and sweet potatoes were dug. Wintertime features roasts, and stews surrounded by dishes made from the canned, pickled or frozen bounties of the past Summer. Like other regional fare, Pennsylvania Dutch foods come with their own unique words. Chow chow, Lebanon bologna, schnitz and knepp, whoopee pies, may sound strange to the uninitiated, but we knew these things were the foods we love. It is said that a proper Pennsylvania Dutch meal consists of seven sweets and seven sours. I never stopped to count them at each meal, but I do know that we never ended a meal feeling hungry. Our life was deeply entwined with the preparation of meals and preserving of harvests; you could say we were obsessed with food. Which leads me to three favorite Pennsylvania Dutch dishes that I would like to introduce to you: Chicken Corn Soup, Chicken Pot Pie, and Shoo Fly Pie. A soup, a stew, and PIE! Chicken corn soup and chicken pot pie start with rich stock made with the carcass and deglazed pan from Sunday’s roast chicken (we were fortunate to have a rotisserie in our oven, making the best caramelized stock). Both of these dishes also can use either leftover chicken, but more often we would pressure cook a small chicken and its giblets to obtain a bit more stock and provide moist chicken meat for the pot. To pressure cook a chicken, cut the chicken in half, add to pressure cooker with a roughly chopped carrot, a stalk of celery, an onion, a few cloves of garlic, sprigs of thyme and parsley, bay leaf, salt and pepper. Fill the pot about a third full of water, attach the lid and heat until steam is released. Reduce heat so steam just puffs out of the vent. Twenty minutes is usually long enough to cook the chicken. Run cool water over the pot to relieve pressure. Once the chicken is cool enough to handle, separate the meat in bite size pieces. Remove all of the skin, bones and cartilage. Strain the stock. Reserve the giblets on the side. Chicken corn soup is a hearty version of chicken noodle soup, frequently served for lunch. It was made not only during peak corn season, but also through the year using corn that was blanched, shocked in ice water, cut from the cob and frozen at the height of sweetness. Chicken corn soup includes not just fine egg noodles, but also small dumplings known as rivvels. Rivvels are used in Pennsylvania Dutch ham and bean soup, too. Chicken corn soup also has diced hard-boiled egg, which adds flavor and texture to the dish. I like to dice chicken giblets into the soup as well; it’s a good place to use giblets accumulated in the freezer from past chicken meals. Chicken pot pie holds a special place in the hearts of lovers of Pennsylvania Dutch foods. In Pennsylvania Dutch country, one will frequently see fire houses and churches advertising pot pie suppers. At our house, it was frequently requested as the meal of choice for a birthday or upon returning home after a cold Winter outing. Pennsylvania Dutch pot pie is not a pie; it has no crust. It is more of a stew with flat, square noodles. The noodles can be purchased as dried noodles, but they are easy and tasty to make at home. Pennsylvania Dutch pot pie can be made with beef, ham, venison, turkey, but the most common is chicken. It is a comforting dish that is easy to make and can be made in large quantities to feed a crowd. I once made enough to feed 150 people at a Cub Scout campout. I saved the best for last: shoo fly pie. My mother used to sing, “Shoo fly pie and apple pan dowdy make your eyes light up and your stomach say howdy!” This pie is definitely worth singing about. 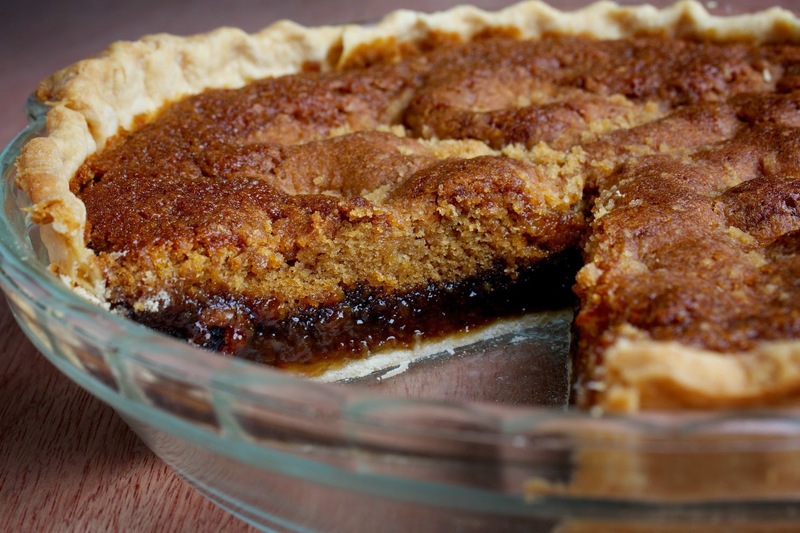 It is a pie crust containing layers of buttery, sugary, molasses-y deliciousness. The bottom of the pie is gooey gelatinous molasses. On top of that is a moist cake-y layer like a light molasses cookie, and the pie is topped with a buttery crumble. Flaky pie crust and the three inside layers create a sensational combination of flavor and texture. I have eaten many shoo fly pies in my time, but I am going to share with you the recipe for the ultimate version of this pie, bar none. Mrs. Witmeyer, an elderly neighbor of my Lancaster childhood, shared this recipe with my mom and she will be forever remembered whenever we enjoy this delicious pie. Chicken corn soup is a staple of Pennsylvania Dutch picnics and summer gatherings. Make and freeze the stock in advance to save time. Turkey stock can also be used. Leftover chicken can be used as long as it’s not dry; good soup requires nice moist bites of chicken. To freeze corn, wait until you find the sweetest corn of the season, and then go back and buy several dozen ears. Blanch the husked and silked corn in boiling water for 3 minutes, then remove to an ice water bath. Cut the kernels from the cobs while holding the cob vertically against the bottom of a large tub or bowl. This will catch all of the sweet juice with the kernels of corn. Scrape the back edge of the knife against the cob to get all of the corn and juice. Scoop corn and juice into freezer bags, and press out any air before sealing. Chicken corn soup will keep in the refrigerator for a week, leftovers can be frozen in containers. Rivvels – lightly beat 2 eggs, add pinch of salt, and mix with flour with a fork until the dough can be kneaded and no longer sticky, knead until smooth, adding more flour as needed, wrap in plastic and set aside. Heat the stock in a large soup pot over medium heat. Bring to a simmer. Add chicken meat and giblets, if using. When heated, about 3-4 minutes, add the corn. In another 3-4 minutes, add the egg noodles. When the noodles are cooked, add the diced egg. Return the soup to a strong simmer, just under boiling. Add very small pinches of the rivvel dough to the soup. Make sure the rivvels are small, because they will plump during cooking, and large rivvels tend to be dense. Cook for 10-15 minutes. Add the parsley. Taste and adjust salt and pepper as needed. Pot pie is a year round dish in Pennsylvania Dutch country. The stock is made in advance to save time. It is common for us to roast a chicken or turkey not just for that meal, but to make stock for pot pie. The chicken can be cooked and the meat prepped in advance, too. As a variation on a theme, I often smoke chicken leg quarters and make smoked stock from those bones. The moist smoked chicken meat and smoked stock make a distinctive, non-traditional version of pot pie. The most common traditional variation on Pennsylvania Dutch chicken pot pie is with beef, where rich beef stock is used, and the meat is pressure cooked cubes of stew meat. Pot pie noodles may be purchased as a time saver. While not as good as freshly made noodles, they are certainly acceptable. (http://www.pennsylvaniadutchnoodles.com/products/bott-boi) Finished pot pie will keep in the refrigerator for a week. Pot pie can be frozen, but the texture of the potatoes suffers a bit. Blend the flour, salt and butter with a fork. Add the egg and mix until all ingredients are distributed and the mixture is crumbly. Add milk in small amounts and knead until the dough forms into a ball. Wrap in plastic and set aside. Heat the stock to a high simmer. Add the potatoes, carrot, shallot, garlic, and celery. After 10 minutes of simmering, add the chicken meat. Add the saffron (if using – it is traditional, but optional). Bring the pot to a low boil. Separate the noodle dough in 1/3s. Roll out on a floured board (I use my pasta machine) until you can see through the dough. Rub with flour if it gets sticky. You can also roll on waxed paper. The noodles need to be as thin as you can get them. Cut the noodles into 1-1/2” squares. Drop them into the boiling broth. When the surface of the pot is covered with one layer of noodles, stir them in to prevent them from sticking together in one mass. Repeat the process until all of the dough is used. Add the parsley to the pot. This is usually served with minced raw sweet onion on top, and Pennsylvania Dutch Pepper Cabbage (recipe below) and sliced tomatoes on the side. Pepper cabbage is a common salad on the Pennsylvania Dutch table. There are many variations, but it is as the name suggests, cabbage and peppers. It is best made a day or two in advance so the flavor of the dressing soaks into the cabbage and peppers. Finely chop the cabbage and pepper. Mix together in a bowl. In another bowl, whisk the remaining ingredients to make the dressing. Fold the dressing into the cabbage and pepper mixture. Refrigerate. Serve cool. This pie is so good that I used to ask for it when I was asked what kind of cake I would like for my birthday. I did not include a recipe for crust since most pie bakers have a recipe that they swear by. Any nice flaky crust recipe will do. Traditional Pennsylvania Dutch pie crusts were made with leaf lard, but we usually substitute another oil these days. Ole Barrel Syrup makes the best pie, but it can be hard to find. You may substitute a 50/50 blend of corn syrup and molasses. Don’t worry about how long this pie will keep. I have never seen a crumb of one last 24 hours. If a piece manages to survive until morning, it will be eaten with the first cup of coffee. Restaurants serve shoofly pie with whipped cream or ice cream. I prefer to eat this pie on its own with no toppings. Preheat oven to 450F. Crumb together 1 cup flour, 3.4 c brown sugar, and 2 rounded Tablespoons of butter. Reserve ½ cup of this mix for top of pie. Mix Ole Barrel Syrup, egg, ¾ cup hot water and 1 teaspoon vanilla extract. Fold in the crumb mixture. Quickly fold in the ¼ cup of hot water with 1 teaspoon of baking soda. Pour into prepared pie crust. Top with ½ cup reserved crumb mixture. Bake at 450F for 5 minutes, and 375F for 40 minutes.